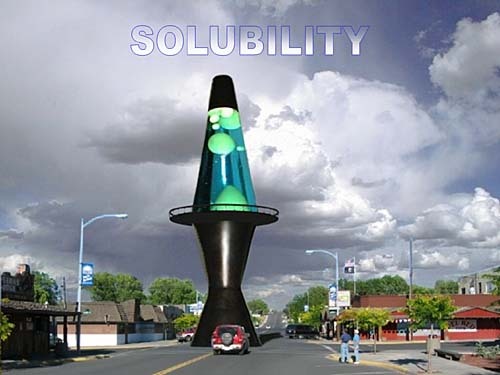 Solubility is the ability of a gas, liquid, or solid to dissolve in water (or sometimes another liquid). A lava lamp, however, depends on the globs not being soluble. It also depends on the globs being about the same density as water. It took years to develop the right ingredients to make a lava lamp work. The motto regarding solubility is "Like Dissolves Like." 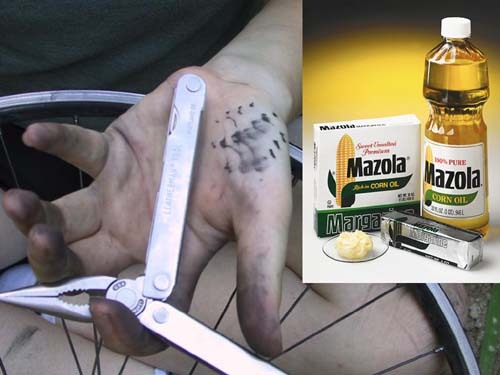 For example, to clean off grease, use something that is greasy like vegetable oil or butter. I had one student say he noticed potato chips cleaned his hands. It must have been the oil in the chips. 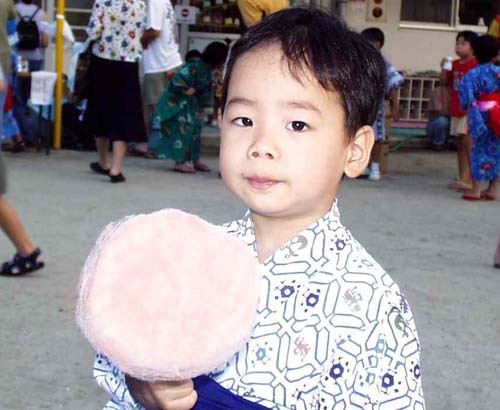 This child has a clean face now, but after eating the cotton candy, it won't be. To clean off cotton candy we know that water would good for that, not oil. Remembering "Like Dissolves Like" we guess that water and sugar must be alike in some way. Let's throw in several of the small bar magnets. At first they will just be randomly mixed with the marbles. However, since magnets have north and south poles that attract each other, magnets will start to stick to other magnets. In a little while a different arrangement will occur. The magnets pull toward each other and push the marbles out of the way as they come together. The glass marbles have no poles, so the magnets have no attraction to them. The magnets will find an arrangement that allows for opposite poles to get closer to each other and like poles to stay as far away from each other as possible. Also, since metal magnets are more dense than glass, gravity would pull them to the bottom. Instead of magnets, consider what happens when mixing in wood sticks. Wood has no magnetic poles so it doesn't attract other pieces of wood. 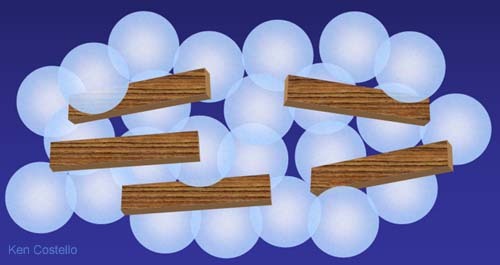 The wood sticks would stay randomly mixed with the marbles. Now let's throw in a mixture of bar magnets, horseshoe magnets, wood sticks, and wood balls. As you might expect, only the items that have magnetic poles will try to reorganize. The items that have magnetic poles pull on each other and squeeze the items they don't attract out of the way. 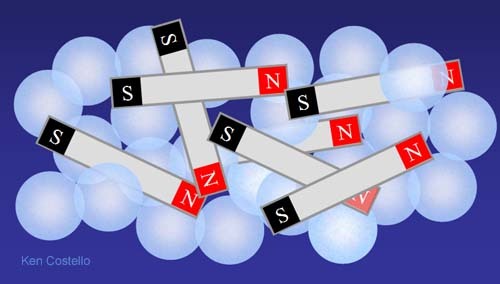 If the magnetic items are more dense than the non-magnetic items, they will end up below (like shown). If the magnets have the same density as the non-magnetic items, they end up as a ball in the middle. In every case, they separate themselves from the items that don't have any magnetic poles. It' not that the magnets repel the wood or glass, it's just they are very attracted to only things magnetic. The above picture explains Like Dissolves Like. Items that act like magnets will attract each other and become mixed or dissolved in each other. Items that do not act like magnets will stay mixed or dissolved in each other. To explain why water and oil do not mix, we will find out that water is like a magnet, but instead of magnetic north and south poles, it has plus and minus electrical poles. The effect is the same. The plus end of water is attracted to the negative end of a different water molecule. The plus end is where the two hydrogens attach to the oxygen atom. That's worth repeating. The plus end of water is attracted to the negative end of a different water molecule. They align themselves + to - . The motion in the water would keep them more random than is shown here, but this picture is close to what water would do when brought to freezing. Why is water positive toward the hydrogen end? If we look at all of the protons (+) and electrons (-) of both hydrogen and oxygen, this is what we see. If you count the bottom half you get 4 protons and 5 electrons (a minus 1 net charge). If you count the top half, you get 6 protons and 5 electrons (a plus 1 net charge). 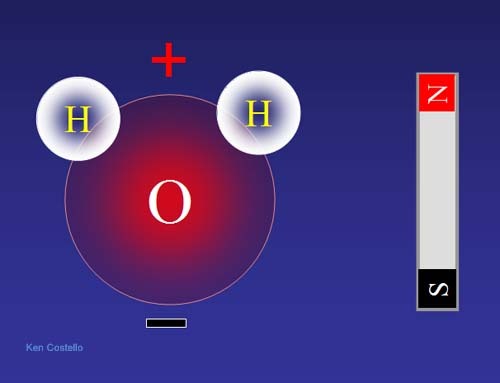 Even though this is a simplification because electrons are in motion, we still get the idea why the top half (hydrogen half) is positive and the bottom half (oxygen only half) is negative. 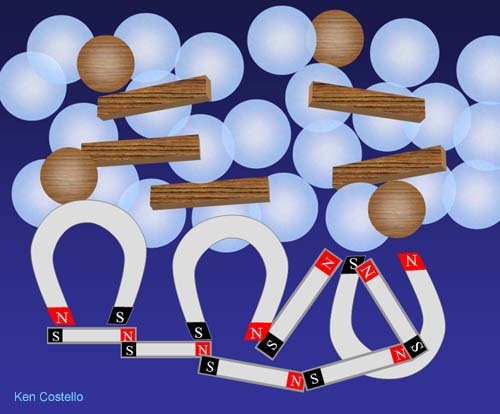 Molecules like water that have plus and negative poles (like magnetic poles) are called POLAR. Molecular that do not have any negative or positive poles are called nonpolar. Because of the strong attraction water has to itself due to the plus to minus attraction, water tries to pull itself into a spherical shape. This attraction also accounts for what's called "surface tension." Water molecules lock together to form a skin where water meets the air. Insects take advantage of this surface tension to stand on the surface. Weve heard that wax or oils repel water. But that isnt true. Water is so attracted to other water molecules that anything between them is squeezed out of the way. (Roll cursor over image to see animation). Water is always trying to pull itself into a tight ball as long as there is nothing nearby that has a charge on it. Therefore, this surface is not repelling water; its simply not attracting it and keeping water from doing what it does naturally. Again, wax on a car's paint doesn't repel water, it simply isn't attracting it. Water pulls itself into beads on its own. 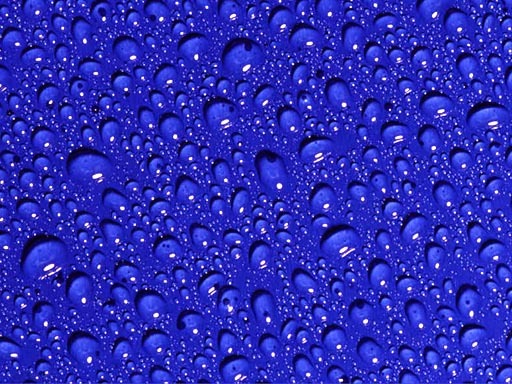 Since water pulls itself together strongly to form drops, raindrops are possible. 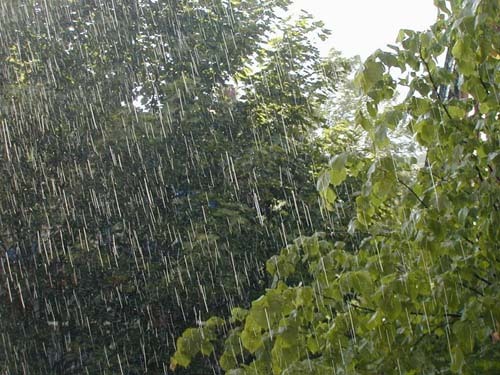 I don't know of any other liquid that could fall from the sky and keep itself in drops. Most liquids would just break up into tiny drops or fog. Let's return to water's ability to dissolve many substances. The substances that water is good dissolving are those that have a charge. Here is sodium chloride (table salt). 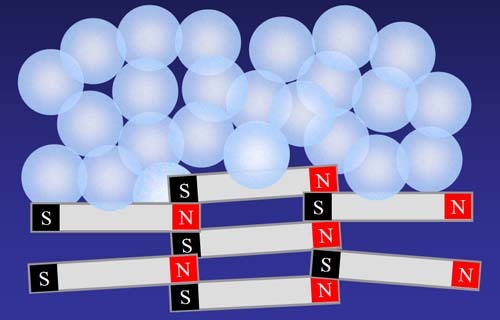 Sodium has a net plus charge because chlorine has taken one of sodium's electrons. This makes chlorine negative because it has an extra electron. The negative end of water pulls on the sodium atom and the positive end of other water molecules pull on the negatively charged chlorine. Like a magnet that pulls on things that are magnetic, water pulls on things that are electrically charged. Magnets have north & south poles, water has positive and negative poles and thus called a polar solvent. 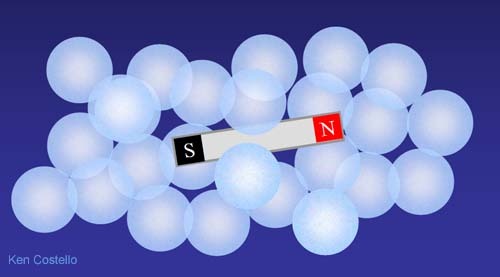 Since unlike charges attract, the negative end of water will be attracted to the positive sodium ion. The positive end of water will be attracted to the negative chloride ion. Since water is always in motion, it will pull on the ionic compound and move the ions away from each other. This dissolves the ionic compound. (Roll cursor over image to see animation). Salts, like NaCl (table salt) are basically a metal combined with a non-metal. See the below Periodic Table of the Elements which is color-coded for metals versus non-metals. 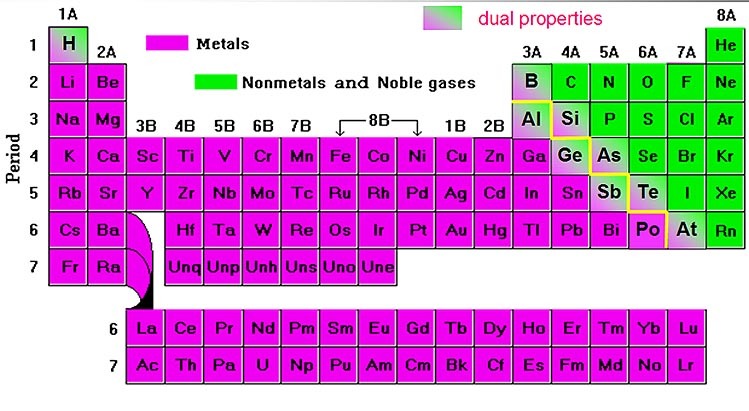 The elements colored with green are non-metals and the ones in purple are metals. The ones that blend from green to purple have qualities of both a metal and non-metal. In the upper right you will see "7A." Below that are the elements called "halogens." Halo means salt, and gen means generate. So halogen means salt generator. The main elements in this column are fluorine, chlorine, bromine, iodine. When these come in contact with a metal, they quickly turn the metal into a powdery salt. The metal will have a positive charge because the halogen pulls an electron off. The halogen then becomes negatively charged. As you know water is attracted to these charges and will try to pull it apart. A lot of metals are toxic, so if they are in salt form, they may dissolve (pulled apart by water) and contaminate drinking water. Another class of compounds that are soluble in water are nitrates. The sources of nitrates are shown below - barnyard and human waste plus synthesized fertilizers. Nitrate is made up of one nitrogen combined with three oxygens and one extra electron (NO3)-. 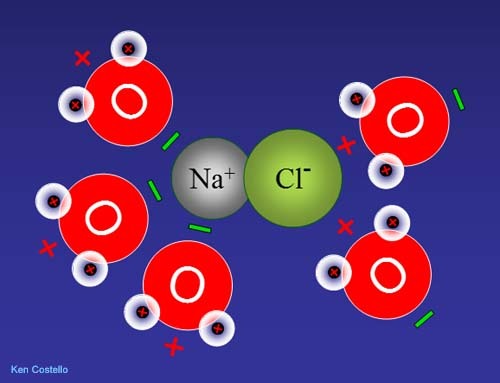 This is attached to either a positive metal like sodium (Na+) or potassium (K+) or ammonium (NH4+) Again, water goes after anything charged, so these are easily dissolved by water and carried into drinking water resources. For babies, this can be deadly. Babies' stomachs are less acid than normal allowing bacteria in the stomach to convert nitrate (NO3)- into nitrite (NO2)-. Nitrite gets into the blood system and prevents the hemoglobin in red blood cells from absorbing oxygen. This results in the "blue" baby syndrome. Let's return our attention as to what is soluble and what isn't. To the left is a chain of carbon and hydrogen atoms. We call these hydrocarbons. This one is about 7 carbons long and is typical of gasoline. 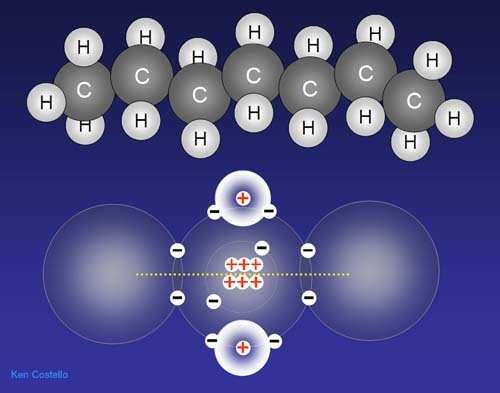 The bottom image shows the charges of a carbon atom attached to two hydrogens. You may notice that unlike water the charge is divided evenly. 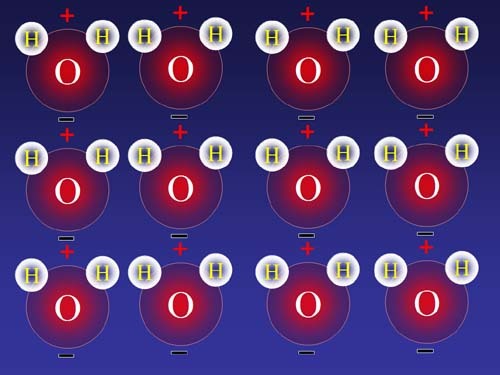 Also the electrons going around hydrogen do a good job of hiding the hydrogen's proton. That way water isn't attracted to it. Therefore, if water and gasoline are mixed, water senses no charge on the gasoline and simply squeezes the gasoline out of its way as it tries to attach to other water molecules. Some compounds have weak plus and minus charges and can dissolve in both polar and non-polar solvents (solvents are liquids used for dissolving something). A chain of carbons have no charge, but if a carbon is replaced with an oxygen, a small electric pole is created. Notice that oxygen has 8 protons compared to carbon's six. That means it has more pulling power to pull in electrons. 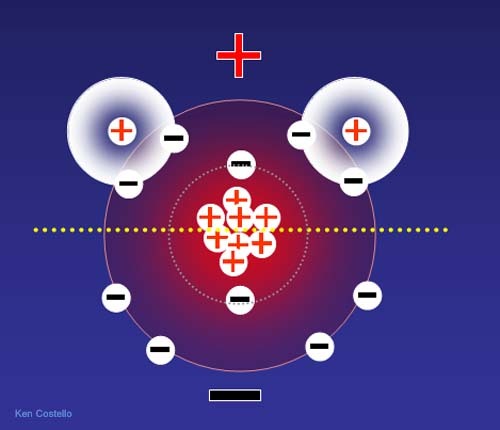 Instead of showing the electrons, I'm just showing the overall electron cloud. 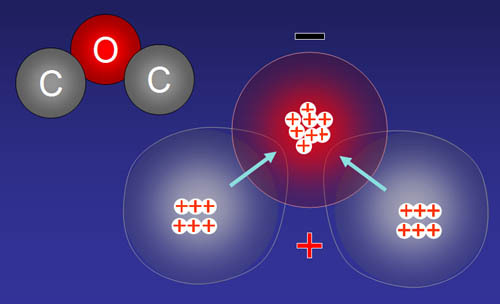 The arrows indicate that the general position of the electrons that surround the carbons are pulled in closer to the oxygen atom. Because of this, the oxygen atom has more electrons around it (on average) than it has protons, making it a partially negative charge. The carbons then don't have all the electrons around it to cancel out the 6 protons' positive charge. So the carbons appear to be partially positive. 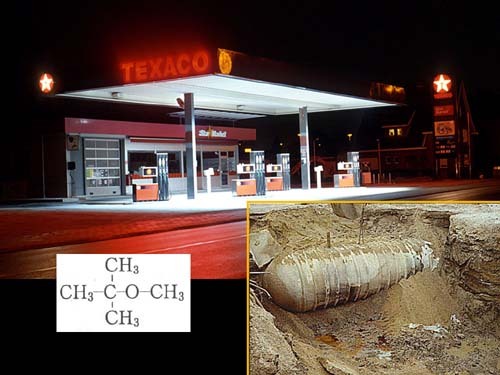 A compound added to gasoline to help it burn more cleanly is Methyl Tertiary Butyl Ether, abbreviated as MTBE. 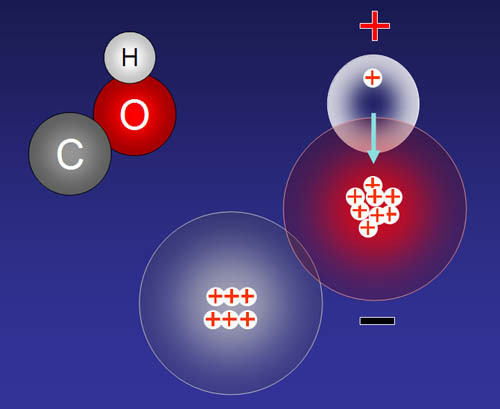 Notice the formula shows a carbon attached to an oxygen attached to another carbon. Like the above diagram, the oxygen will pull electrons closer to it. This makes the oxygen partially negatively charged. But it's enough charge for water to pull on it and make it dissolve in water. Unfortunately, many gasoline storage tanks leak and the MTBE is easily dissolved by rain water, which can carry the MTBE into the drinking water supplies. Over 20,000 tanks are estimated as leaking in the state of Virginia alone. 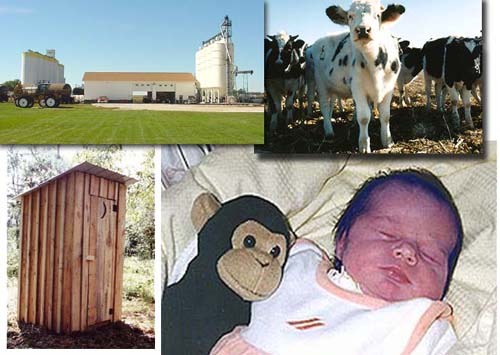 MTBE is a known to cause cancer in animals and possibly humans. But even extremely small amounts that would not be dangerous can add a turpentine taste to water and make the water undrinkable just because of bad taste. It's ironic that the oxygen atom that provides oxygen for cleaner combustion is also the reason that MTBE is water soluble and a threat to drinking water. 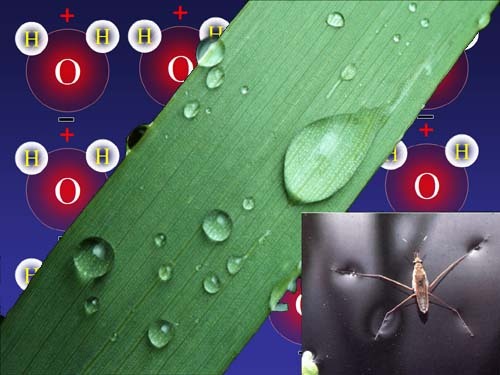 When a hydrogen is attached to the oxygen, the oxygen finds it easier to pull the hydrogen's electron in closer than it does the carbons' electrons. When hydrogen's electron is spending much more time orbiting the oxygen, the hydrogen's proton is exposed. That makes the area around the hydrogen a partial positive charge. And since the oxygen has an extra electron most of the time, it becomes a partial negative charge. This arrangement of carbon, oxygen, and hydrogen is what you find in sugar. That's why sugar dissolves in water. Here is a 3-d model of the sugar, glucose. 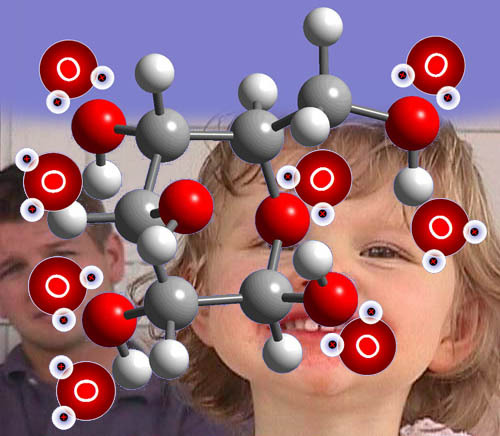 I've placed water molecules at strategic places around the sugar molecule. Do you notice that the positive side of water is attracted to the negative oxygen atoms? The negative side of water is attracted to the positive hydrogens which are bonded to the oxygens (not the other hydrogens bonded to carbons). Because water pulls the charged areas, it will pull the sugar into the water and hold it there. That's why water is good at cleaning the face of someone eating cotton candy or other sweets.